Alec McClennan grew up playing every sport imaginable on his backyard lawn. In high school biology he learned of the dangers of chemical lawn treatment and researched some alternative, organic lawn care products. Alec later graduated with a degree in civil systems engineering from the University of Pennsylvania. 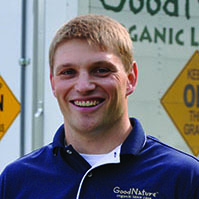 He furthered his passion for safer lawn care by founding Good Nature Organic Lawn Care. Today, Alec is back in his boyhood home of Chagrin Falls, Ohio, where he lives with his wife, Jennifer, and his two children.